The Housing Element is one of seven required elements of the General Plan. However, it has several unique requirements that set it apart from the other six elements. State law (Government Code Section 65580 (et seq.)) specifies in detail the topics that the Housing Element must address and sets a schedule for regular updates. State law requires each local government to update its Housing Element every eight years. The Housing Element is also the only element reviewed and certified by the State for compliance with State law. The Department of Housing and Community Development (HCD) is the State department responsible for this certification. Each jurisdiction in California is required to plan for its fair share of the region’s housing need. This fair share is determined through a process called the Regional Housing Need Allocation (RHNA). HCD identifies the total housing need for each region of the state. 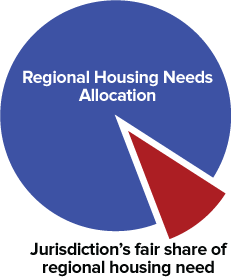 Regional Councils of Government (e.g., ABAG) are responsible for dividing the regional housing need allocation among all of its local cities, towns, and counties. Once a local government has received its RHNA, it must revise its Housing Element to show how it plans to accommodate its portion of the region’s housing need. The ABAG Board adopted the 2014-2022 Regional Housing Needs Plan on July 18, 2013. The purpose of the Housing Element is to identify and analyze existing and projected housing needs in order to preserve, improve, and develop housing for all economic segments of the community. The Housing Element consists of two parts: the Background Report and the Policy Document. The Background Report identifies the nature and extent of the city’s housing needs, which in turn provides the basis for the City’s response to those needs in the Policy Document. The City of Union City last updated its Housing Element in 2010. That Element covered a 7½-year planning period from 2007 to 2014. The City is currently working on an update of the 2010 Housing Element. The planning period for the 2015 Housing Element is January 31, 2015, to January 31, 2023. Upon adoption the 2014 Housing Element will become part of the Union City General Plan.